Computer science freshmen, Brett Case, Logan Phipps, and Taegan Warren (left to right), won honorable mention at QuackHack. 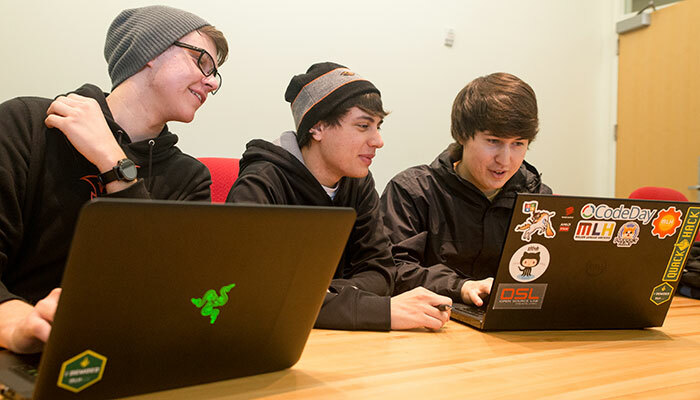 Computer science freshmen, Brett Case, Logan Phipps and Taegan Warren had completed just one computer science class at Oregon State University, but their lack of expertise didn’t stop them from participating in QuackHack. The 40-hour gaming hackathon, held at the University of Oregon, challenged students to take an idea for a game and create a working prototype in a single weekend. 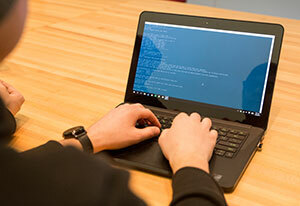 The trio entered the event for the learning experience and to see if they could create something with the basic programming skills they acquired in their introductory computer science class. To their surprise, the virtual card game they created — in which players build hamburgers and feed them to the opponent — won an honorable mention for Best Scope, awarded to a team that had a reasonable goal and excellent execution of that goal. “The judges were impressed not only by their execution, but how well the students knew their own skill in going after a project that was equal parts ambitious and reasonable,” said Jeff Bayes, QuackHack organizer. More than 100 college students from 6 states, 14 universities and 16 different majors participated in the hackathon. “We didn’t really expect to compete against more experienced people, but we decided we might as well go for it for our own benefit,” Phipps said. “We just wanted to go and have fun and try to make something,” Case agreed. To create their game within the short time frame, the team divvied up the programming components of the project. In the end, their separate functions had to come together to make the game work. The teamwork is also crucial. “We helped each other with our weaknesses and built upon our strengths,” Warren said. We enjoyed having so many Beavs participating in QuackHack and look forward to attending OSU’s DamHacks in the spring.